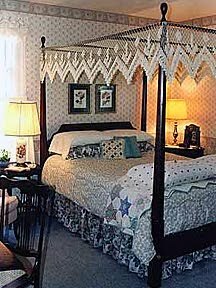 In Sturgeon Bay, Wisconsin you will find the White Lace Inn. 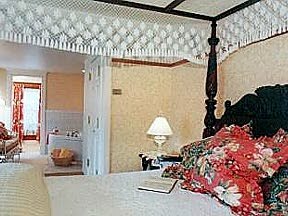 Their Door County Orchard and Romantic Retreat Rooms each incorporate a variety of colors and have beds canopied with the Double Diamond (above) and Lover’s Knot (left) fishnet styles. Serene shades of soft aquamarine and ivory lend a dreamy quality to the Maria room at the Thorp House Inn in Fish Creek, Wisconsin. 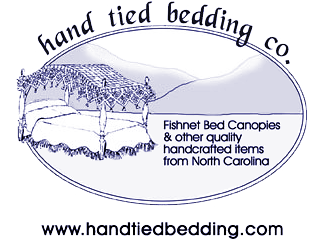 A Margaret Winston fishnet canopy covers a queen-size, four-poster bed. The Riverwind Country Inn in Deep River, Connecticut boasts the Barn Rose Room. 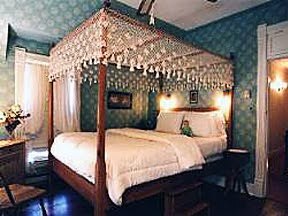 A pencil post double bed topped with a Single Diamond fishnet canopy nestles in this room amid delicate floral wallpaper and stenciling. A tiny sheep leaps a fence under the lacy canopy to assure a peaceful sleep. 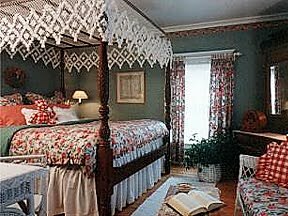 At the John Orr House in Mercer, Pennsylvania, the “Quilt Room” displays a fishnet canopy atop the cherry canopy bed covered with a Large Scallop fishnet canopy.